Learn Mandarin Chinese Phrases- Why Chinese Grandparents are Special? The Chinese are traditionally very family oriented. Confucius taught us to respect our elders and this sentiment still runs deep in Chinese society. It’s common for grandparents to share their children’s marital homes, cooking for their 20-something offspring and taking care of their grandkids. Perhaps this is why China’s older generations remain so active into later life, getting out of the house well into their eighties to have fun and socialize! This post covers some key Mandarin Chinese phrases to help you address the older generation when you encounter them out and about in China. We also look at some of the most popular activities of retirees in the P.R.C. Wǒ bāng nín zuò ba. Zhù nín wán’r de kāixīn! Get involved in some of the below activities with Chinese grandmas and grandpas, and you may find yourself some regular Mandarin practice partners! The parks of China are filled each day with retirees dancing to Chinese classics – and even some modern tunes. The country has a long history of social dancing (this website has some wonderful old dance photos!). Men and women congregate en-mass, sometimes synchronizing their moves. It can be quite an impressive sight! 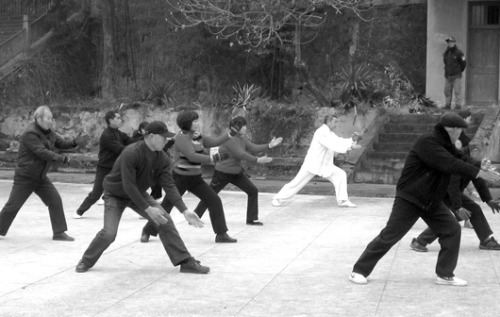 太极拳 is certainly not only an activity of the elderly, but plenty of retirees can be found practicing in parks and open spaces, even on cold winter mornings. 太极拳 promotes flexibility and fitness, and it’s a natural stress buster. Join in if you can; you’ll always be welcomed! Again, we head to the park. Chinese grandparents can often be found on the manual fitness equipment getting their sweat on! It’s a wonderful sight… that is, until you see retirees who can do more pull-ups than you could ever even attempt. An impressive trend amongst those in their “golden years” is to play the stock markets. These retired “pajama traders” regularly head to local tea houses or even brokerage houses for a day of trading. In fact they have gained attention of late, since their individual investments have come to make a huge impact on market trends. As this BBC report describes, “[The retirees] arrive in the mornings with their flasks of green tea and spend the entire day watching the red and green flashing lights and making bold decisions about their future. It’s also a venue for socializing: people are making friends and, of course, passing on tips of the trade. Five useful Chinese phrases you can use when shopping there. 麻将 originated in China in the 18th century and is still popular today. 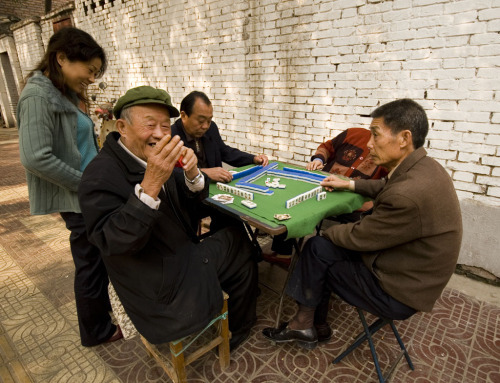 This tile-based game keeps older Chinese engaged for hours, as they play inside or outdoors, often for small sums of cash. If you can hold your own at the mahjong table, you can easily “做朋友” (zuò péng you, make friends) amongst China’s older folk! NOTE: Depending on where you are, older generations might not speak standard Mandarin (Putonghua) so don’t be disheartened if communication isn’t smooth. If you can make yourself understood, however, Chinese grandparents can be great practice partners!